What’s Up!? This Girl is on Fire!!! Meet Christine Raia! She’s the Director of the award winning short film Juiceit! She’s also the creator of IndieWorks and the webseries Kelsey. Definitely on the move in terms of new projects, awards and festival efforts, watch the trailer for Juiceit here and share your thoughts! Christina , co founder of Congested Cat Productions is a great example of the best of emerging filmmakers. She’s creative, driven, very funny and always working in ways to not just help herself but help others. To that end, she created Congested Cat Productions. In additional to it being their production company, they also have invented other options: IndieWorks, in it’s third year of monthly screenings for emerging artists; Summit, her feature film and Kelsey their webseries. 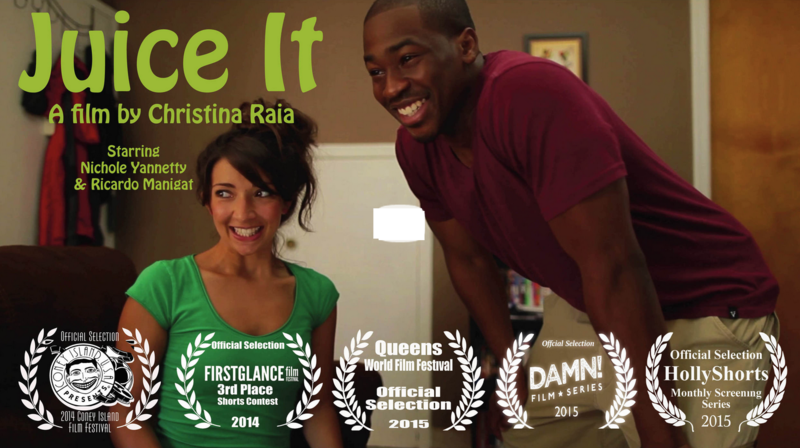 So, jump on itsashort.com and check out Juiceit and meet Christina Raia. They are raising funds for several new projects and entering lots of new festivals. We want to see them this fall at TIFF, or Chicago International Film Festival or SXSW in 2016. Let’s help her get there! Hey everyone! We hope you are loving itsashort.com., the website for award winning/nominated short film, video and webseries. We like to feature festivals, artists, short film, video and webseries, to find ways to introduce our audiences to amazing work. Juice it has been accepted at several festivals during the season and has won a fare share. Unless you happen to be in the city during the festival, how would anyone get to know this work. That’s the reason for itsashort.com. we want to support our artists and their festivals or just their work. Join us as we build this community, comment on the work, leave notes for the artists and please, share this posts and others. These voices have wonderful stories to tell and share…thank you! What's Up: PSI Shortfest and Alan Becker and Animation!